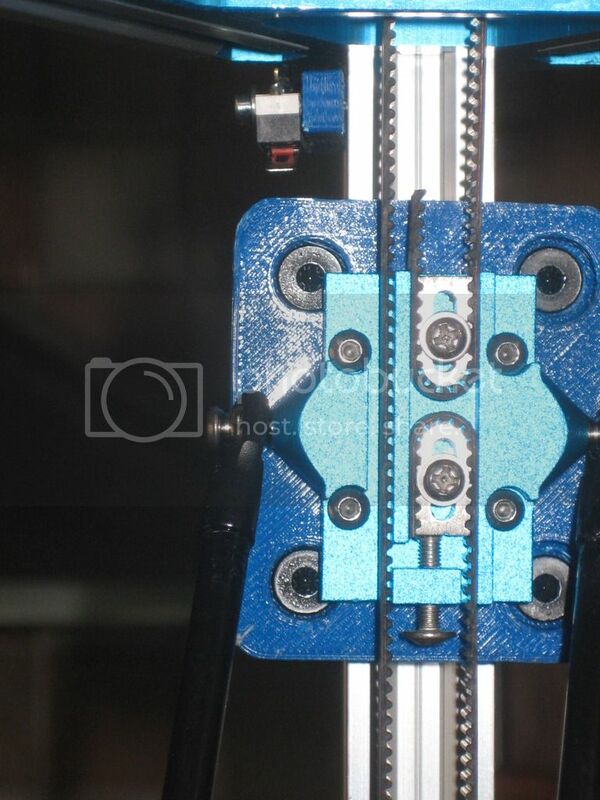 Andy is using Bosch/Rexroth 2020 T-slot extrusions, IIRC. The mini-V wheels ride inside the beveled edges of the slots, although not as nicely as they do in the proper V-slot extrusion. I use V slot wheels on Motedis 2020 I-profile extrusions, and they work well. My original Mini Kossel kit used the same wheels on Mitsumi 1515 extrusions, and they worked well too. I wish motedis would sell fitting delrin wheels for their aluminium profiles. It's a great shop with very fair prices in Europe! Hmm I think we need is kind of an "inverse kickstarter". Customers request / pledge for certain items to be manufactured and companies can bid to make them! I tend to use them for linear rail type stuff and Motedis for all my other Extrusion/accessories. Well, I had a try, and made some progress. I processed the file in Slic3r without making any changes from those used with my Prusa. The final result was a lot neater, but was slow to produce and very stringy. I went in and made some changes, increasing the speed and de-selecting the "use firmware retraction" checkbox that had been set previously for some reason. The result is quite decent, I think. The top fill on the 4 corner steps isn't as nice as I'd like, being quite rough and messy. However, it's a big step forward from previous results. Edited 2 time(s). Last edit at 06/15/2015 01:48PM by David J. If you send me the .stl you are printing I'll give it a try on my CPIII and see what I can come up with in terms of Cura settings. YOBO I only wish that was true the mistakes I have made along the way. Do you have a picture of your carriages using the 4 v-wheels, you have peeked my interest. Yeah I want to use 4 wheels for the carriage as well. But without the eccentric spacers. If you want the Cad files I can post them as well and if you say what format you'd like I can try and export them (I Use Freecad). 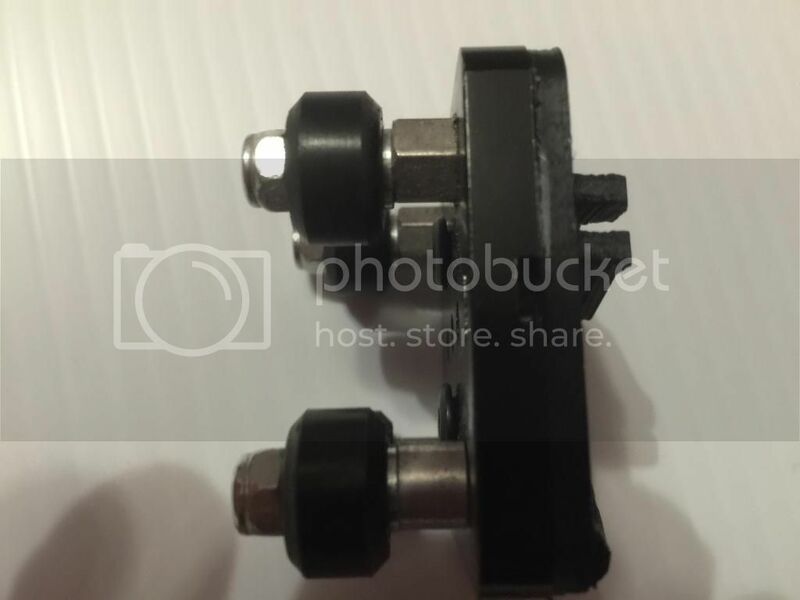 Sorry bout the focus on the first 2 but you should get the idea the second one shows the Hexagonal Eccentric Spacer's (1/4 inch ones to replace the standard ones) and I have used the OpenBuilds V-Slot extrusion). Thanks for the pictures! 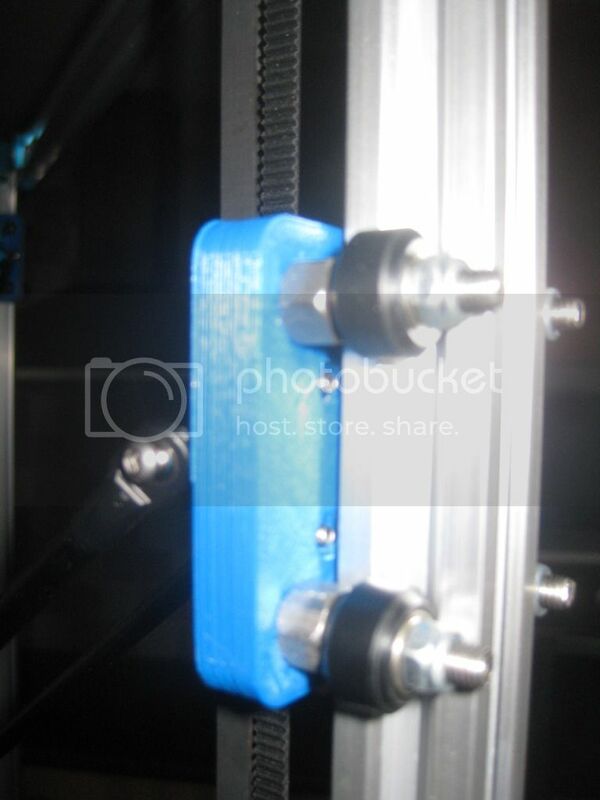 I'm going to try to 3D print the eccentric spacers. That belt tension system on the robodig parts looks nice also. I'm not a huge fan of this design in general, as the OpenBuilds plate and eccentrics will not provide me with enough adjustment range to take all of the slop out of the wheels on their V-slot extrusions. Well that's a real bummer vreihen... But I want to build a delta with 4020 verticals so I'll need to print my own "plate" anyway. Still some time off though. The reason I didn't use them is the hole pattern on them (For mounting the Rod Carrier's) was not quite right (I could have got them to fit but would only of used 2 holes and ofset from the joint centres which I didn't want) hence I took the openbuild design and extended the height by 10 mm and put my own bolt pattern in for the carriers. I find that there is plenty of adjustment in them for the Openbuilds V-Slot rails which is after all what they are designed for. I have managed to get them set up with no descernable backlash in fact I may have them a little to tight. Dejay ooznest have engineering drawing's of the plates on there website. I think that they did consider the offset carriage and dimensioned everything from the non Eccentric holes see Mini Vee Wheel carriages Drawing (Openbuildpartstore done seem to have this published) and it is this drawing I used to do my own and altered the vertical spacing of the wheels by I think 10 mm which helps to run a little truer as well must admit that mine are also close to the limit of adjust ment and maybe reducing the width between centres of the holes from 31.9 to something more like 31.5 may have been better. 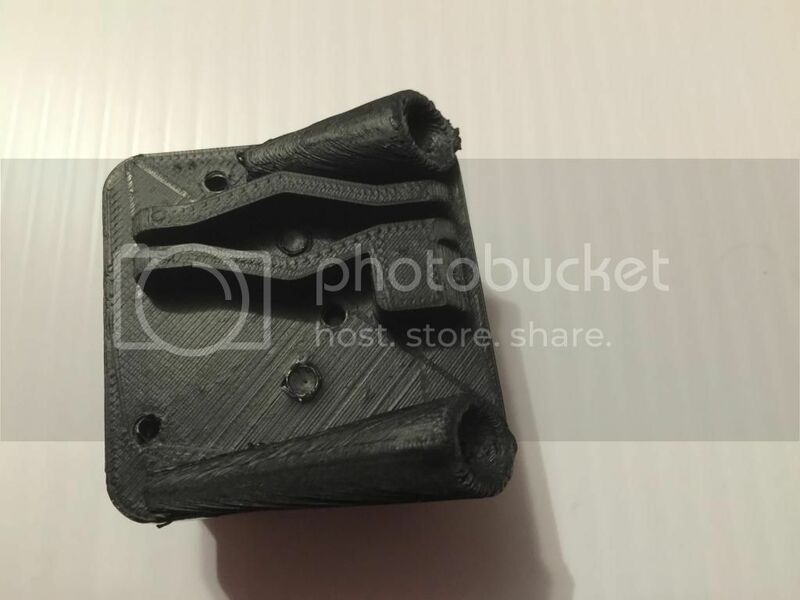 I printed mine in ABS and made them 10 mm thick. Printer seems to be doing ok at the moment still a little bit of fine tuning to do but I am printing at 100 mm/s at the moment next job will be an enclosure for ABS Printing. I'm starting my build now, and I want to use all the 220mm of the MK3 round aluminium heated bed. What is the calculation I need to do in order to know the length or the rods I need to cover all this area? I'm using 10mm balls and not 8mm. In the BOM at thingierse, Andy says that the build area is about 190x190 mm, and he cut to rods to 225mm. Also, I want to get 300mm build height, 650mm extrusion will be enough with the longer new rods? I know I can cut 270mm rods and use 700mm extrusion and it probably fit my needs, but arms longer than I need will reduce the printable height, and I want my printer to be as small as possible. There's been quite a bit of discussion on rod length but I always use a length that is 80% of the distance between tower centres, or thereabouts. A good rule of thumb is that the rods should be at 30 degrees to the vertical when the effector is centred, which means the rod lengths are twice the delta radius. Slightly shorter is OK, e.g. I have 300mm printable diameter, 180mm delta radius, and 350mm rods. Edited 1 time(s). Last edit at 06/18/2015 08:01PM by dc42. I did some calculation for 220mm printable diameter, but I didn't know if i'm correct. This is the length of the arms when they are at the end of the 220mm bed, and the arms are 90 degrees with the tower, which I don't think is good. For 300mm printable diameter my calculation gave 314mm rods, so I did the right calculations. I don't sure about all the distances and length I used in the calculator, but it's a good estimation I think. Edited 2 time(s). Last edit at 06/19/2015 04:03AM by itaysp. For 300mm printable diameter my calculation gave 337mm rods, so I did the right calculations. 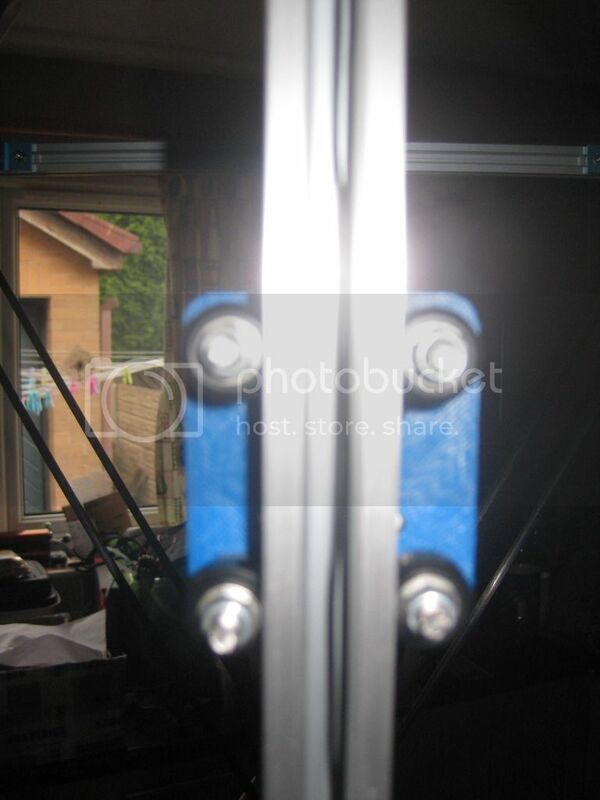 Doing the sums for my printer, the angle of the rods to the vertical works out as 31 degrees. So your 32.9 degrees is still a little high compared to my build, and you might want to make the arms a little longer still. Therefore, if the geometry allowed the rods to become vertical when the effector is close to a tower, you would have print radius = delta radius. In practice, the effector can''t usually get that close, so the print radius is less then the delta radius (by 30mm in my build). If the arms are long enough and the joints have enough movement, you may be able to print out to more than the "print radius" as I have defined it above when the effector is between the nearest towers. I edit my calculations and put a link to the calculator (in my last post). Edited 2 time(s). Last edit at 06/19/2015 07:40AM by itaysp. Anybody know what I have done wrong? I have the motor ratings in the config.g file set to 1700, which is what the stepper motors are supposedly rated for, but setting this at 1000 doesn't appear to make a difference to the noise after move. Reading around about stepper motors and I think I understand. The noise when the motor is not moving is because you have to keep the stepper energised to stop in moving. I never heard this on the ramps, but I guess the voltage to hold the motor was different in the drivers I had on the ramps. Edited 1 time(s). Last edit at 06/19/2015 10:54PM by Matt,Wheatley. Running the motors at their rated current is not necessary and not a good idea. Both the motors and the drivers will get hot. If the motors are 48mm long Nema 17s like mine (which are also rated at 1.7A), then 800mA is probably enough (I use just 500mA for my extruder motor). If they are shorter, you may need 1000mA to 1200mA. Your RAMPS drivers will have been set much lower than 1.7A - if you know what voltage you had them adjusted to, you can work it out. After editing new values into the M906 command in config.g and uploading it, you need to restart the machine to make it read config.g again. The easiest way to do this is to use the Emergency Stop button on the web interface. You can also adjust current on the fly sending the M906 command to the printer. Sending M906 with no parameters causes the existing values to be echoes back. The reason it goes quieter after a while is that after 30 seconds of inactivity, the firmware reduces the current to the idle hold value. By default, this is 30% of the normal current. You can adjust it using the I parameter in the M906 command, e.g. M906 I50 will make the idle hold current 50% of the normal current. Thanks David, That makes sense, I have dropped the current on all the motors now. Anything I should be looking at. Edit, it actually looks like the calibration isn't running fully. It only probes all the points once then homes, which I thought might mean its finished, however I just had it probe all the points twice then just stop and not home. Edited 1 time(s). Last edit at 06/20/2015 01:25PM by Matt,Wheatley.